We’ve been having insurance problems lately. (Lately? When have we not had insurance hassles?) Fortunately, we’re not having health problems…just insurance problems. Most recently, the clinic that measured Julianna for her new shoe inserts–in August–called to ask me to get a detailed justification from my doctor, because the insurance was balking at paying; these inserts are different from the ones she’s used the last couple of years. Balking, even though, to the best of my knowledge, they’re cheaper. I called my mom to complain, and she paused. “That sounds like a reasonable request to me,” she said. I got to thinking–yeah, actually, you know, it probably is. But it made me realize, too, that this is one of those slice-of-life moments that people who have typically-developing kids will probably never see. And so I decided to blog about it. Most people have kids who learn to walk wearing the worst foot support known to humankind, and they do just fine. (Kids are adaptible that way.) Most people, when their kids outgrow a pair of shoes, go to the store and buy a new one. As best we can tell, the cost for this insert was upwards of $1000. Enter insurance, who interestingly enough, never peeped about paying for them. 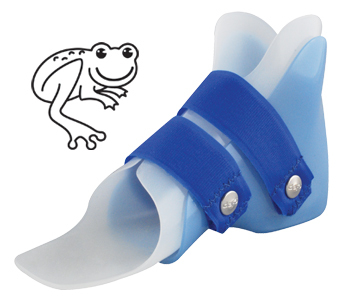 Three velcro straps per shoe: one over the tongue, one on each side. Great shoes. Not so fun for getting them on and off to go through airport security, but fortunately, we don’t fly too often. So this spring, a PT suggested that we try Sure Steps instead: a less rigid, less expensive insert, and, it turns out, one that might be able to fit inside a normal shoe. Midsummer, I realized Julianna’s toes were right at the end of her Hatchbacks, so I started making phone calls. We had an appointment in mid-August to have her measured. Two weeks ago, I got a call from the orthotics place saying the insurance was giving them trouble, and could I please get a note from my doctor? But the doctor is not the origin of the order. The physical therapist is the origin point. So I contacted Julianna’s PT, who wrote up a justification and sent it to me. And I forwarded it to the doctor. And the doctor forwarded it to the orthotics store. And the orthotics store could then, at last, talk to the insurance. So midsummer I put the shoe-buying process in motion, and on the fourtheenth of September, at last, the order was allowed to be placed. Hence my annoyance at the insurance hassle. You’ll never complain about having to go to the Mall to go shoe-shopping, will you? Oh wow, that is a lot to go through for shoes! I know the shoes are more expensive and who knows if it makes a difference, but we do Stride Rite until the kids grow out of them. The shoes last well and are very good supportive shoes. But yes, I thank God we don’t have to go through a process like that…at least these days. Yikes, that’s a lot of hassle for a pair of shoes! I have to say though, as someone who has CP, I had to wear special shoes for years growing up and none of them were as cute as the ones you have pictures above. 🙂 I was forced into hard, black support shoes – and God knows what I put my mother through in trying to avoid wearing them!